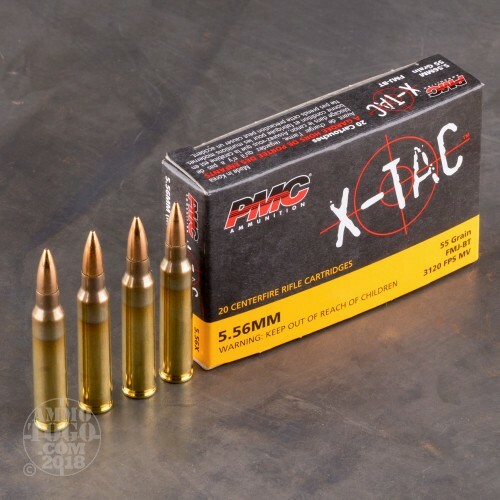 This is 5.56 PMC X-TAC 55gr. 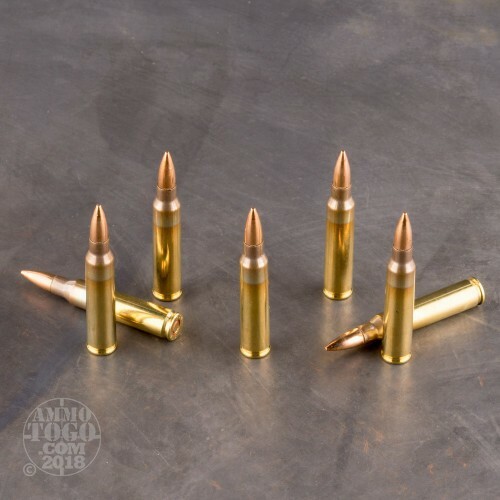 (XP193) Full Metal Jacket Ammo. 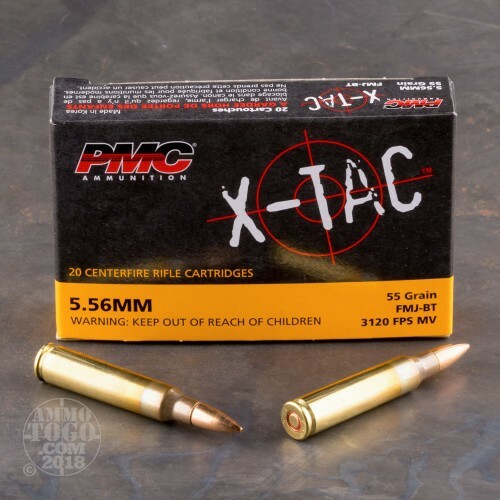 The PMC X-TAC Line is manufactured to the highest industry and military specifications to ensure its performance, without fail, when your life is on the line. 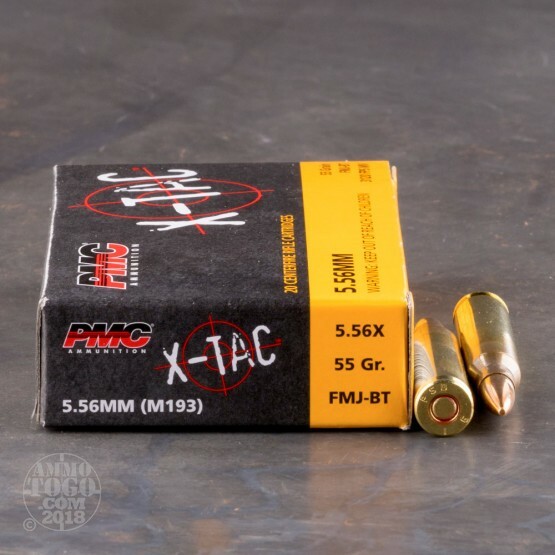 PMC’s X-TAC ammunition is powerful, accurate and dependable, because in a life-threatening situation, no other standard is acceptable. PMC's exacting adherence to the precise specifications of military and law-enforcement organizations assures that X-TAC ammunition will perform perfectly in that fraction of a second when a serious threat arises. This ammo comes packed in 20rd. boxes, 50 boxes per case. Their customer service and fast shipping is the true definition of excellent customer service. Great ammo. Very accurate. My DDM4 V7 Pro love's it. Good ammo to plink with, not very accurate but good reliable and priced right. As usual A2G shipped promptly, thanks! The last case of X-Tac 55g 5.56 I bought functioned perfectly shoots cleanly and very accurately out of my Noveske Afghan. This standard 55g 5.56 ammo is better than the very similar Federal/Lake City 5.56 which is not as clean shooting. May be slightly more consistent than the Federal 5.56 past 400m. Easy hits at 400-600 yards from prone using EOTech HHSII holosight. Buy it when it's on sale cheap and be happy. Good cycling and accurate ammunition but a very high muzzle flash. If you need this for self defense the flash is even well visible during the day. At night it gives away your location as if it was the intent of the ammunition's design. Excellent service!! Great folks to deal with. Good Price! Fast delivery! I will be back. Will update on the performance of the ammo later. OUTSTANDING MILSPEC 55 GR.5.56. MORE ACCURATE AND CHEAPER THAN FEDERAL XM193, WORKS GREAT IN EVERYTHING INCLUDING FN M249S BELT FED SAW. Great ammo , great price and fast delivery ! Will definitely purchase more from ammo to go ! posted on 8/5/16 by Gary Kil. Ordered at good price. Paid extra shipping about .80 cents for stealth shipping because I live in apartment complex, unfortunately the box still had markings of small arms ammunition, not big but still written on two sides. 5 stars still because of service. It was dropped at office and signed for by employee. Fed Ex didn't leave note on door so I assumed package was misdirected. Called and left email after hours to ammo to go and they called back immediately and said they will fix it. Next day when my office opened at apartments, they indeed received the box and no problems. Ammo to go kept reaching out to me to make it right even though come to find out it was not a problem related to them. I'm kind of shocked at the service. Will I buy again yes. Great pricing. We couldn't believe how quickly the ammo was delivered. Will definitely purchase again. Update on the ammo. Shot some tonight. Good groups and nice clean ammo! Will buy more! Thanks again ammo to go! This review is on Ammo to go customer service. Excellent Customer Service!They answered all my questions with good knowledge of the products. Fast delivery! I will be back. Will update on the performance of the ammo later. PMC has always been good in other calibers for me, so I anticipate good results! Exceptional customer service from Ammunition-to-Go; competitive prices as well. Definitely will be a repeat customer.